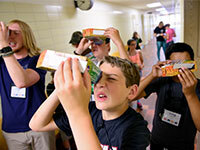 Engineers in Wyoming will engage with more than 3,000 students for National Engineers Week on Feb. 17-23. Wyoming engineers will share their experiences and knowledge with the state’s elementary-school students as part of National Engineers Week on Feb. 17-23. For the fourth-consecutive year, the University of Wyoming College of Engineering and Applied Science (CEAS) has partnered with the Wyoming State Board of Professional Engineers and Land Surveyors to create a free program that brings professional engineers into third-grade classrooms to lead a one-hour hands-on activity. The goal is to inspire innovative thinking among students to encourage participation in science, technology, engineering and mathematics (STEM). The Wyoming State Board of Professional Engineers and Land Surveyors Facebook page and Twitter feed will be updated regularly to highlight the experiences of participants. Towns in Wyoming with elementary schools scheduled to participate in Engineers Week activities include: Afton, Arapahoe, Baggs, Bar Nunn, Basin, Big Piney, Buffalo, Burns, Carpenter, Casper, Centennial, Cheyenne, Cody, Cowley, Douglas, Dubois, Ethete, Gillette, Green River, Guernsey, Jackson, Kaycee, La Barge, Lander, Laramie, Lusk, Meeteetse, Pine Bluffs, Pinedale, Powell, Ranchester, Rawlins, Riverton, Rock River, Rock Springs, Saratoga, Sheridan, Shoshoni, Sundance, Ten Sleep, Thayne and Thermopolis. The statewide Tests of Engineering Aptitude, Math and Science (TEAMS) competition will take place Feb. 18 on the UW campus. Every February, UW hosts the Wyoming TEAMS State Competition for high school students. During this day-long competition, students are encouraged to apply math and science knowledge in practical, creative ways to solve real-world engineering challenges. More than 90 students from across the state will participate in this year’s challenge. The winning team earns an invitation to the national TEAMS competition June 28-July 2 in Washington, D.C. Other supporters of the event include the Wyoming NASA Space Grant Consortium and School of Energy Resources.